It recently came to my attention that my To Be Read pile had all but vanished, and it put me on edge. Although other life commitments mean I’m not as prolific a reader as I once was, I still always find it comforting to know that there’s a stack of books available to rifle through if I feel the need to pick up a new one, so to discover there was only one unread book in my bookcase was slightly disconcerting. A visit to my favourite second-hand bookshop immediately shot to the top of my weekend to-do list. The Oxfam bookshop in Headingley is an absolute treasure trove with shelves catering for every genre you can think of; I literally don’t think I’ve ever left without making a purchase. The books are absolute bargains as well – with the price of a book averaging out at around £3.50 you’d be hard pushed to find cheaper on Amazon, and this way you’re paying for instant gratification instead of a painfully long delivery time, and helping a good cause! 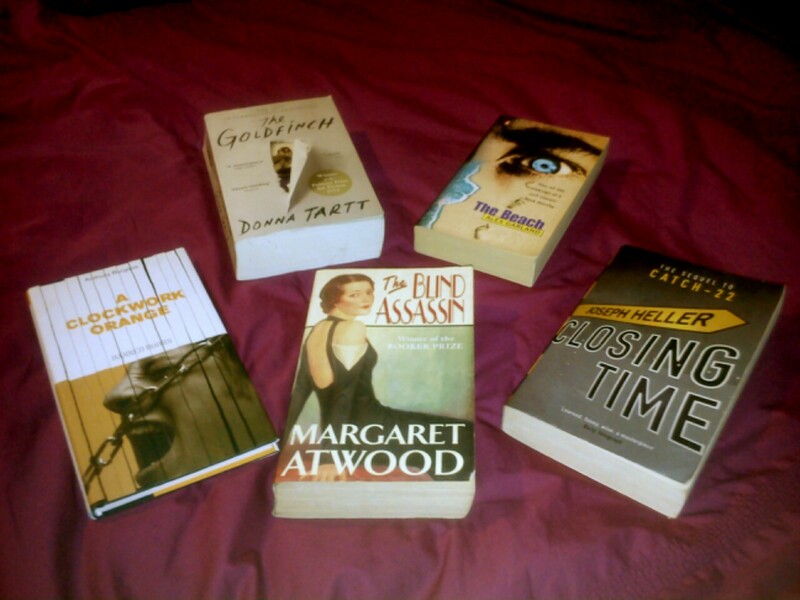 For a feminist bookworm I’m still a relative Margaret Atwood newbie. I read Oryx and Crake at 20 and really enjoyed it, but I followed it up with Cat’s Eye and felt underwhelmed so neglected further reading in favour of more tempting prospects. However a row of Atwood books caught my eye and I remembered reading a lot of praise about The Blind Assassin, so at £2.99 I reasoned it was worth a try. I have very little idea what it’s about – even the blurb is cryptic – but I’m happy to leave it as a surprise! I’ve seen Danny Boyle’s adaptation of The Beach and (Leo-swooning aside) struggled to pay attention for the full two hours, but I’m a firm believer in books being better than their film adaptations. Besides, most of my purchases are pretty heavy subject-wise, and with the adventure storyline and Thai island setting The Beach feels like a slight break from the serious stuff. I’ve got it earmarked as holiday reading – feels like the perfect material for a lazy day of sunbathing. Possibly my most exciting find – I’m super thrilled by this one! Considering how relatively new this book is and the good condition it was in, I almost felt cheeky paying just £4 for it, but I wasn’t going to argue. I read The Secret History earlier this year and fell completely in love – the story was so intensely absorbing, the prose so breathtakingly flawless, that I couldn’t put it down. I haven’t been affected so deeply by a book in a long time, and I can’t wait to see if The Goldfinch measures up. So there’s my reading list for the summer! What’s on yours?